Honeybun and I watched Napoleon Dynamite on DVD this evening. Probably the strangest movie I have ever seen. Honeybun absolutely hated it while I laughed through most of it. There aren’t words to describe it. This is one you just have to experience for yourself. Fancy?, originally uploaded by semperjase. Now I eat at McDonald’s somewhat regularly. One thing I’ve noticed, you can’t find anything “fancy” at McDonald’s. 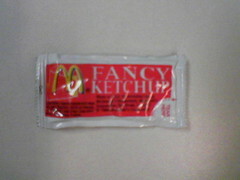 So why are they trying to claim their ketchup is fancy? What makes it different from, say, Wendy’s non-fancy ketchup? More research is required into the mystery of the fancy ketchup. It seems that Mr. Rauch has clarified his views to Hugh Hewitt. He claims that he never meant to equate the religious right with violent actions. At least Mr. Rauch and The New Atlantic have the integrity to clarify instead of entrench and cast even more aspersions. Hugh Hewitt has once again asked for comments. Johnathan Rauch has written a piece for the New Atlantic confusing the religious right with violent 60’s activists. On balance it is probably healthier if religious conservatives are inside the political system than if they operate as insurgents and provocateurs on the outside. Better they should write anti-abortion planks into the Republican platform than bomb abortion clinics. Sadly, Rauch believes that anyone who supports life is equivalent to the few wackos who bombed clinics. That’s right, the bombers that were widely criticized by the religious right are just the same as the religious right. The same is true of the left. The clashes over civil rights and Vietnam turned into street warfare partly because activists were locked out of their own party establishments and had to fight, literally, to be heard. Rauch makes a false comparison. Pro-life people have been against legalized abortion for 32 years. Yet as a group, they have not rioted in the streets like the leftists of the 60’s. The religious right are not the terrorists, “insurgents and provocateurs”, that Rauch believes they are. It’s amazing that someone can grow up in America thinking Christians (which is what they mean by religious right) are terrorists and it is only by the left’s reluctant allowance of Christian participation in the political process that abortion clinics are safe from bombing. Today Honeybun and I set up a membership with the best art site on the Internet – Digital Blasphemy. 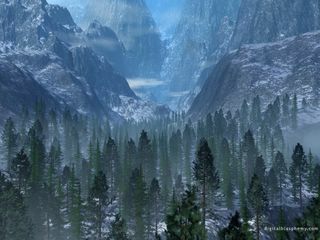 It specializes in images to be used as computer wallpaper. The artist, Ryan, says he makes his sole living by publishing this site and doesn’t accept commission work. Here is a peek of what I’m now using for my desktop wallpaper (with permission from the site). I am absolutely stunned by his scenery and planetscape images. They have a way of making me feel small when I look at them. They suggest greatness beyond humanity. Frankly, I think Ryan would be able to make much more money as a freelance artist. I think he would be better served creating art for book covers and such. I used his free gallery for over a year before getting a membership. Don’t be cheap like me though. The $25 one-year subscription is well worth it. The passing of another legend. Johnny Carson died today. I always thought it was amazing how such a popular entertainer could leave at the peak of his popularity and never seemed to miss the limelight. He was one of the few famous figures who didn’t want a comeback. I’ve come to realize that you can learn new things just by watching other people. I learned something today while I was at lunch. Never wear cycling clothes to go out in public if you aren’t riding a bicycle. What else would a blizzard dump? I am now part of the Ecosystem. You can check out my (lowly) ranking on the left bar of this page. OK, the Tivo is now connected to the home network. Now, we have the ability to program the Tivo from any Internet connection. Say I’m at work and I realize the “A-Team” marathon is on. I can set the Tivo without having to call Honeybun at home. Why? Because I can.